We have a mailing list of people looking for various Jumbo Love animals. 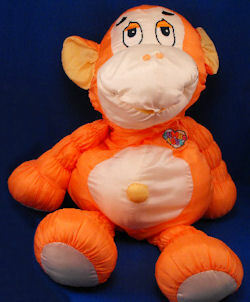 I’m looking for a 1986 Commonwealth Jumbo Love very large Puffalump style orange and white monkey with the Jumbo Love patch over the heart. I am trying to locate this monkey for my daughter. Monks was her constant companion throughout her childhood. I unfortunately made a poor choice for my first husband, who was very emotionally and verbally abusive to all of us. Luci (Michelle, sometimes!) was scarred the worst of the three of us. Monks was her friend, her security, her comfort, her protector. She wore him down to tatters, then tenderly packed him away in a box. The box was misplaced somewhere through the moves, the divorce…..who knows. Now that she is dealing with her husband’s injuries from fighting in Afghanistan, I thought that it would be a comfort to her to have one again. There is so little that we can do for her, and there is no clear diagnosis of the extent of her husband’s injuries. We can only pray that he is “fixable”. Sadly our wonderful liberal Democrats are cutting funds, and they may force him out of the Army before he gets treated. Then….who knows what will happen. Most people don’t understand that funding the military is not about funding war. It is about taking care of the brave men and women – and their families – who sacrifice to protect our freedoms. Without them there would be no Bill of Rights. Sorry, didn’t mean to get on my soapbox. I appreciate any help you can give me in locating Monks2. There was no need to politicize a search for a lost monkey. Seriously. Thanks, Kimmy! The mailing list has been notified. Currently two elephants, one hippo and two blue dogs as well. Under toys and hobby jumbo love. Plus both orange monkeys Carrie found are still available. Also one 11″ MINI GREY BLUE SATIN DOG $299.99. Thanks, Carrie!! Sent to the mailing list.